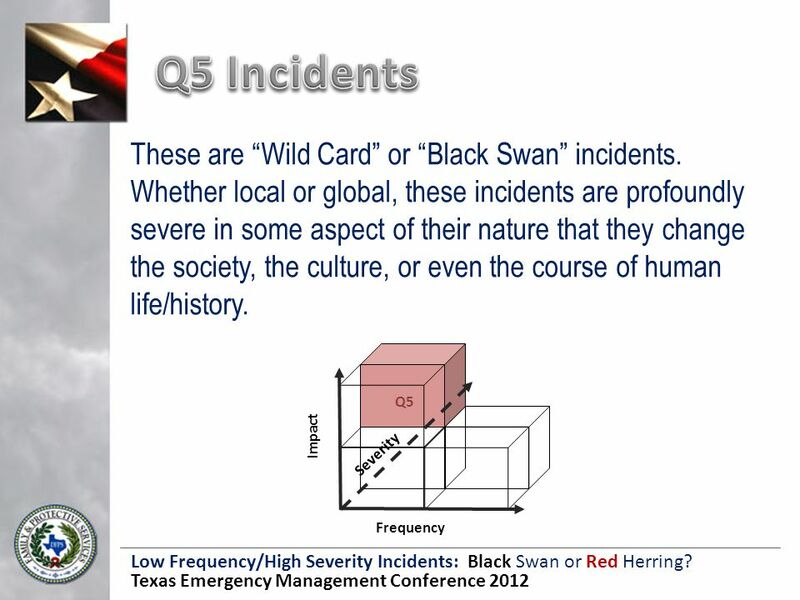 Low Frequency/High Severity Incidents: Black Swan or Red Herring? 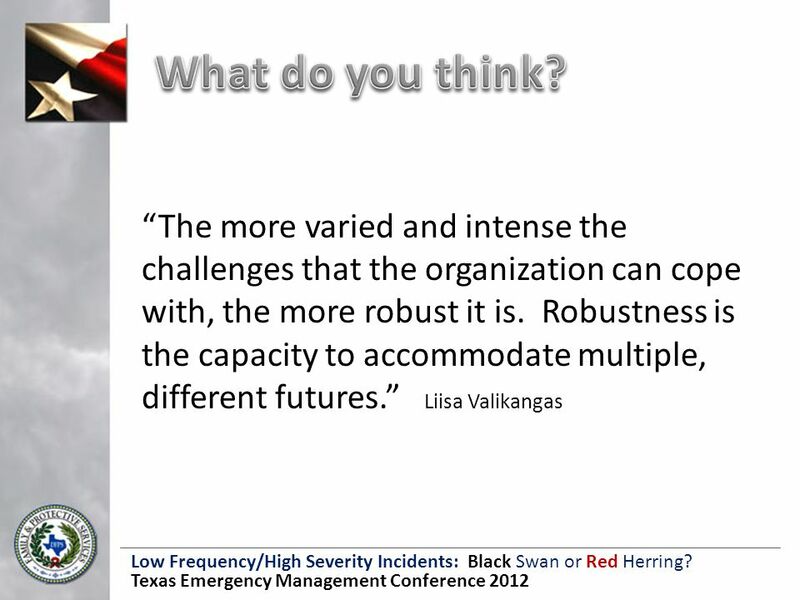 Texas Emergency Management Conference 2012 Black Swan or Red Herring? 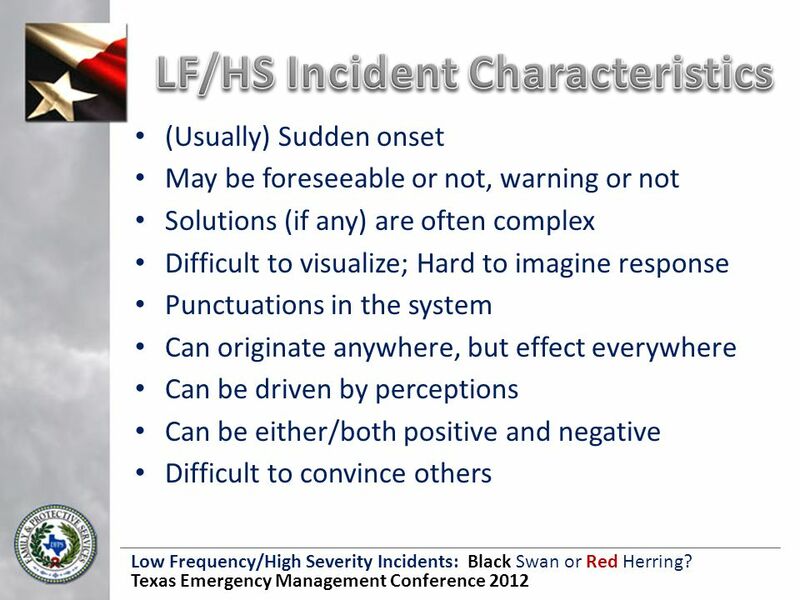 1 Low Frequency/High Severity Incidents: Black Swan or Red Herring? 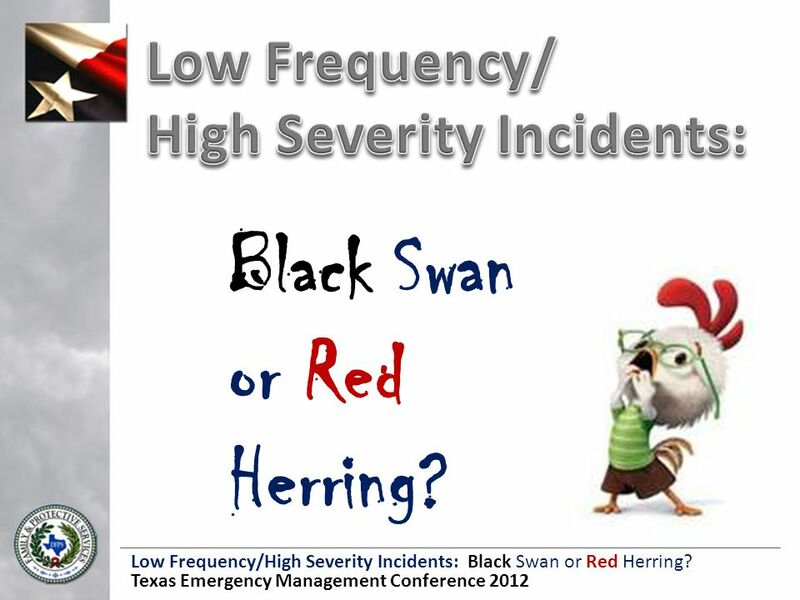 Texas Emergency Management Conference 2012 Black Swan or Red Herring? 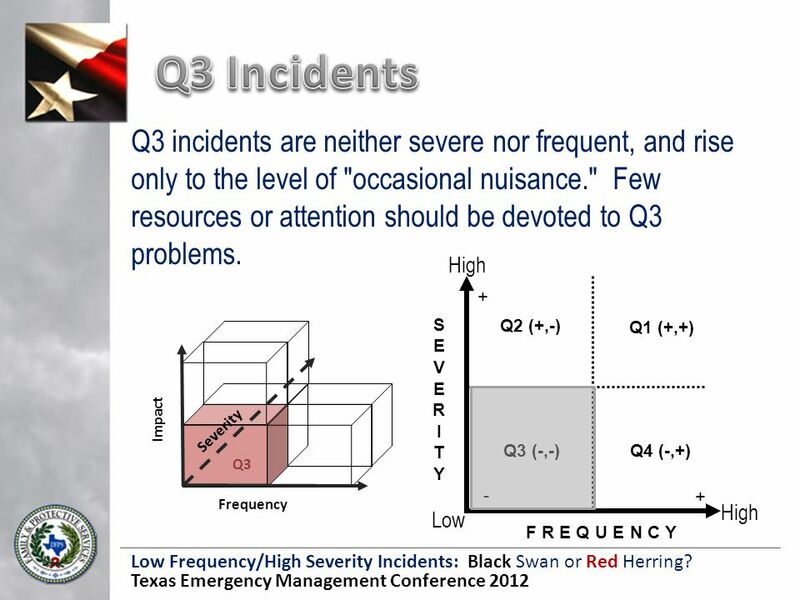 3 Low Frequency/High Severity Incidents: Black Swan or Red Herring? 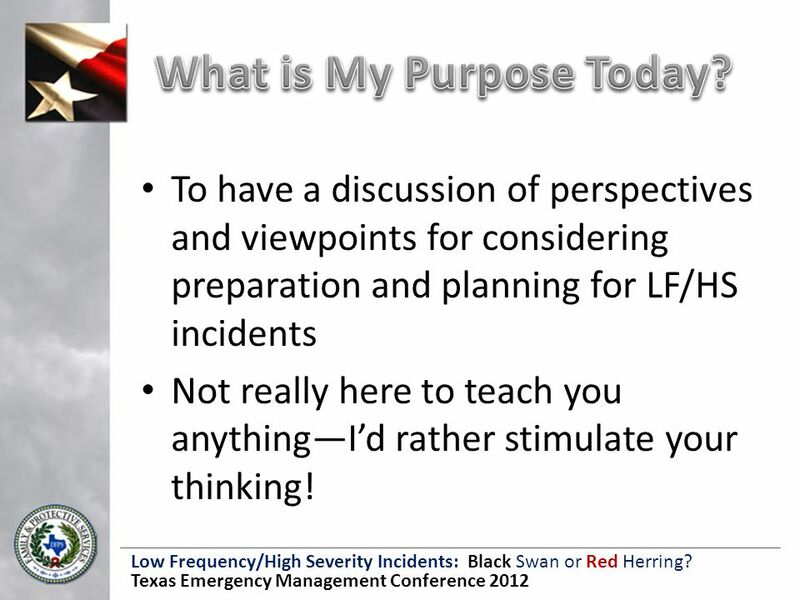 Texas Emergency Management Conference 2012 To have a discussion of perspectives and viewpoints for considering preparation and planning for LF/HS incidents Not really here to teach you anything—I’d rather stimulate your thinking! 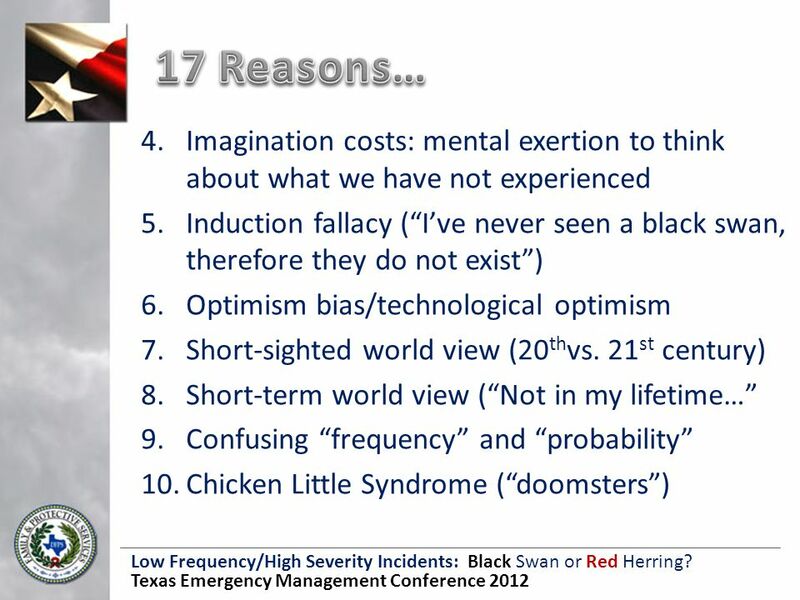 12 Low Frequency/High Severity Incidents: Black Swan or Red Herring? Texas Emergency Management Conference 2012 When we say “Low probability…” we typically add the qualifying elliptical clauses, “…in my lifetime” and/or “…in my experience;” Catastrophes on a global scale are an established part of earth’s history; “Low probability” is more appropriately “Unknown probability” in many cases. 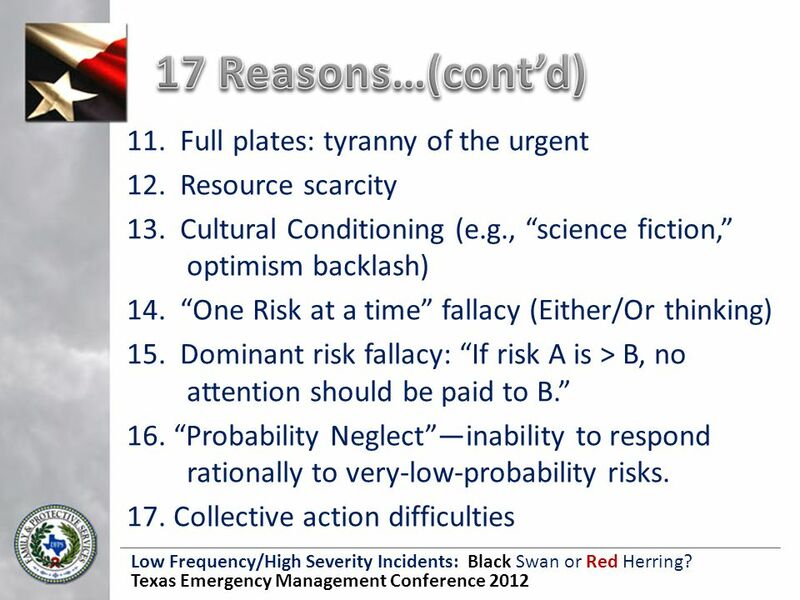 15 Low Frequency/High Severity Incidents: Black Swan or Red Herring? 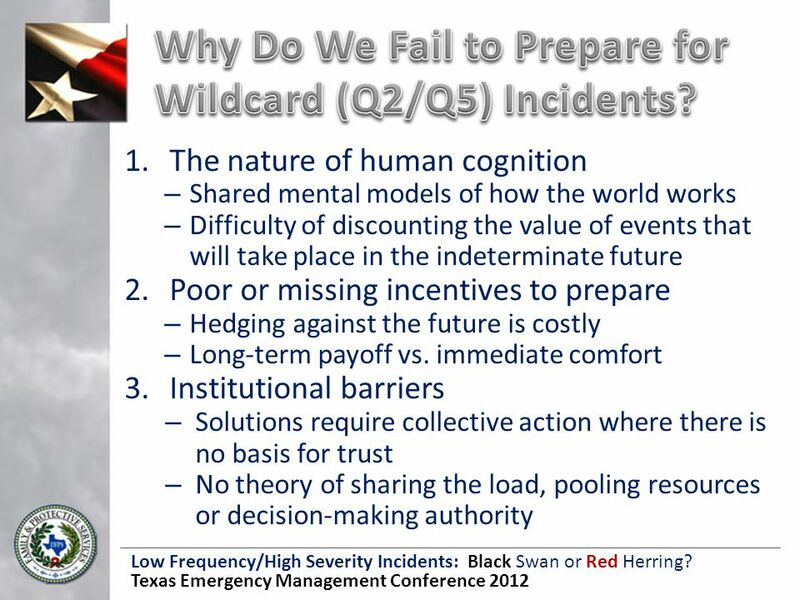 Texas Emergency Management Conference 2012 If you don’t think about wildcards before they happen, all of the value of thinking about them is lost! 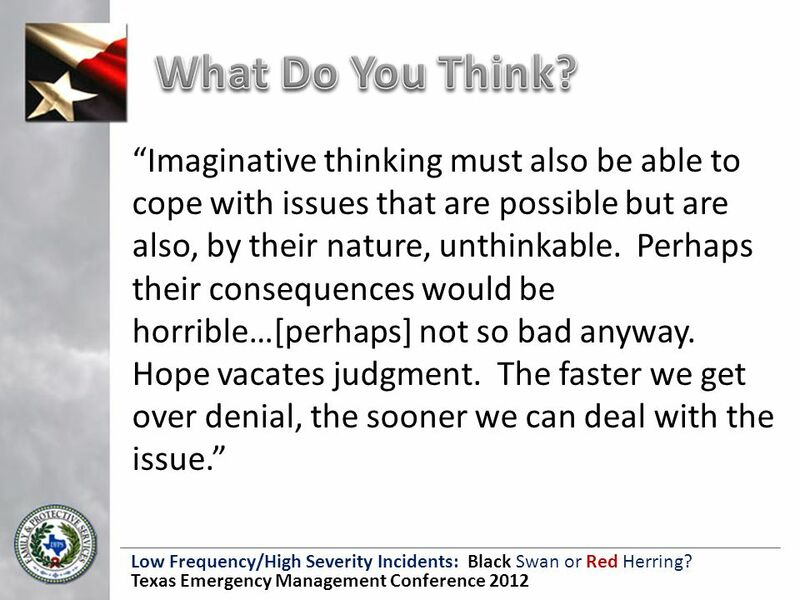 Understanding how to think about problems is as important (or more!) than solving all problems. 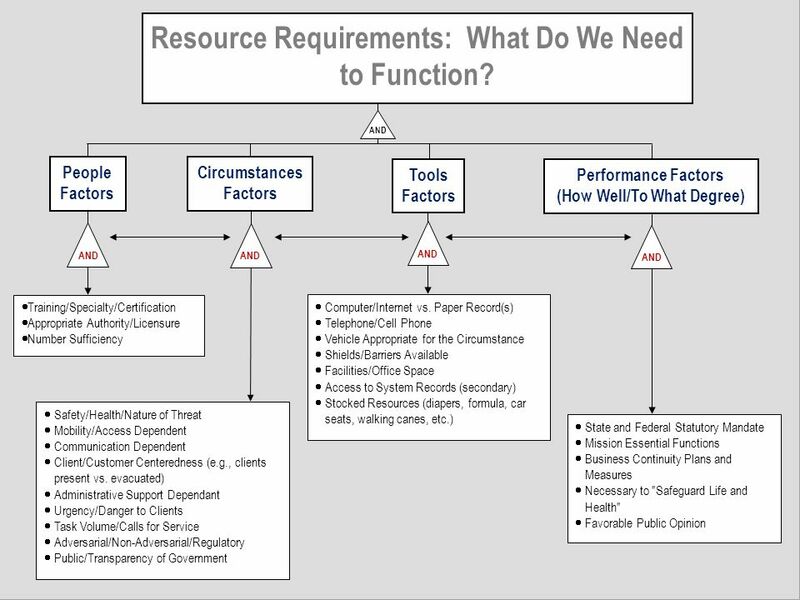 Accessing and understanding information beforehand is key! 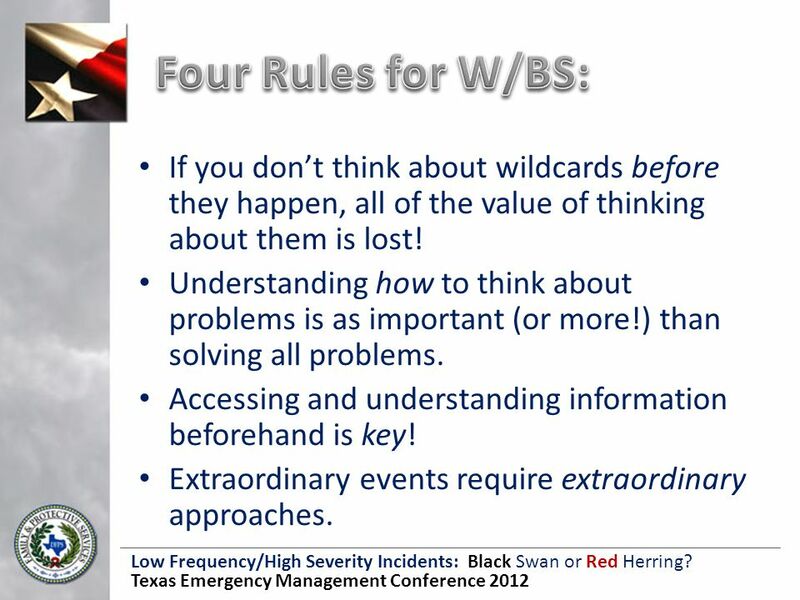 Extraordinary events require extraordinary approaches. 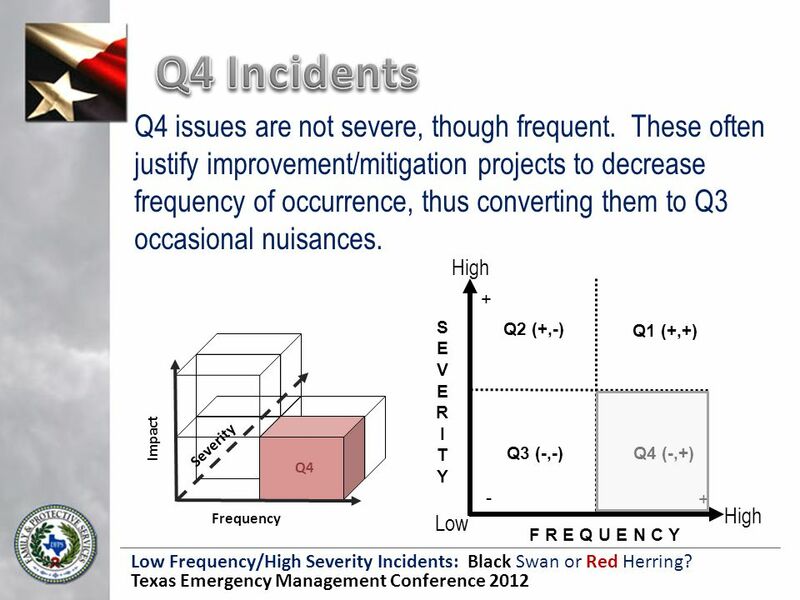 24 Low Frequency/High Severity Incidents: Black Swan or Red Herring? 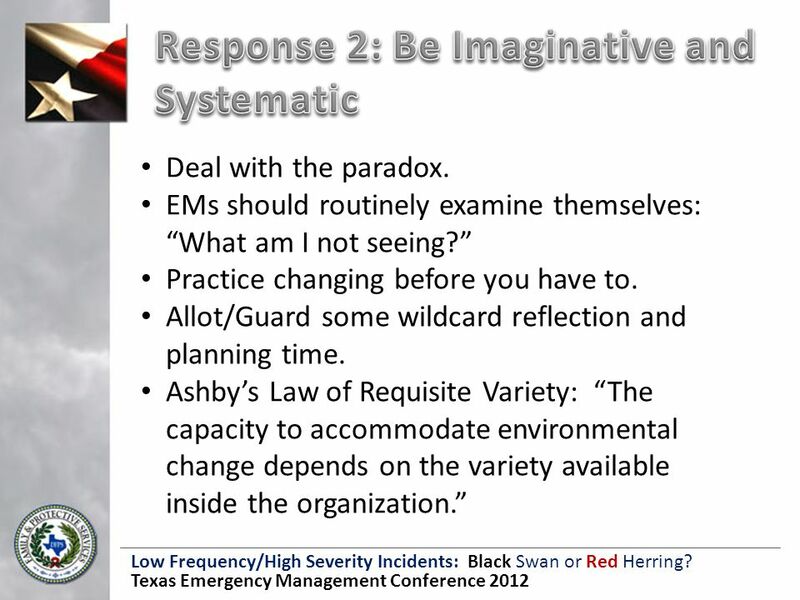 Texas Emergency Management Conference 2012 Purposeful/Intentional monitoring of the internal and external environments. 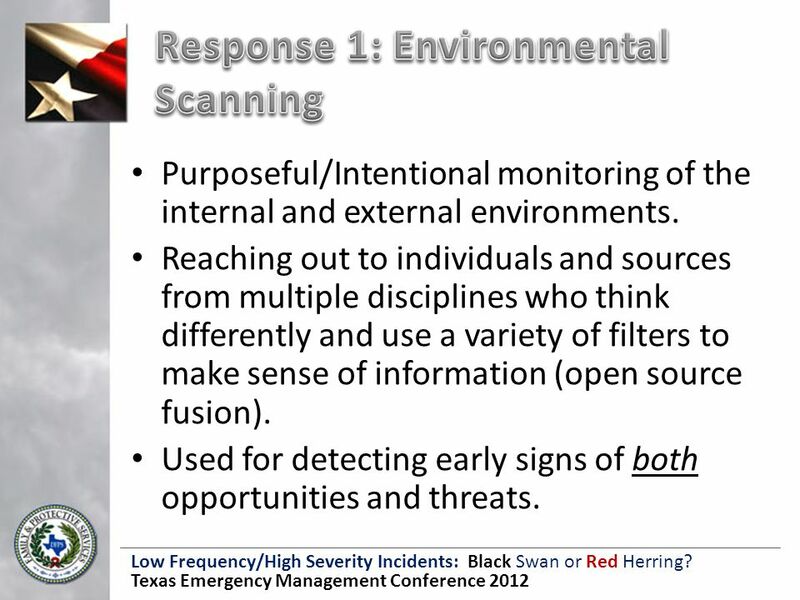 Reaching out to individuals and sources from multiple disciplines who think differently and use a variety of filters to make sense of information (open source fusion). 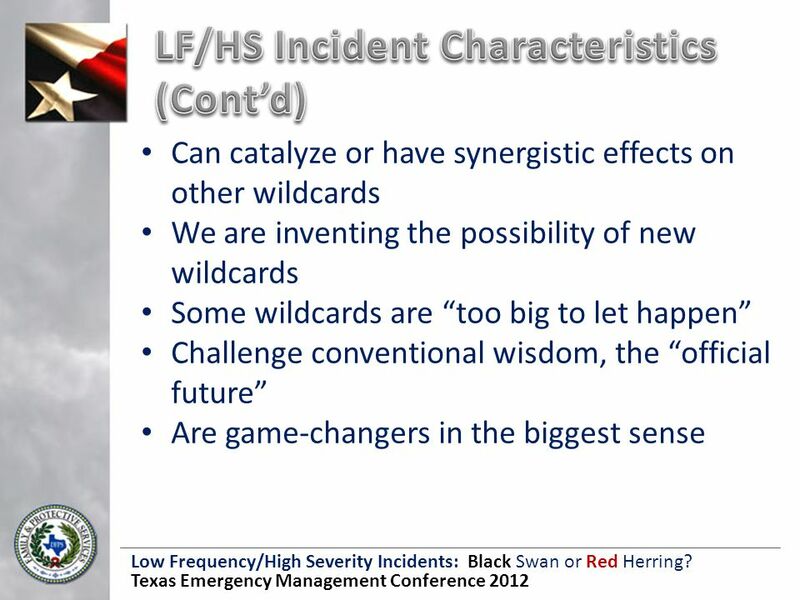 Used for detecting early signs of both opportunities and threats. 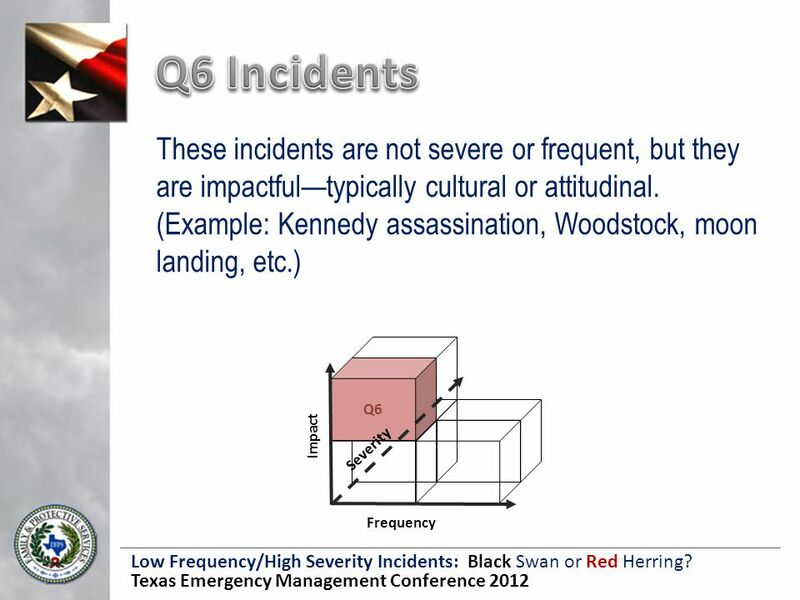 27 Low Frequency/High Severity Incidents: Black Swan or Red Herring? 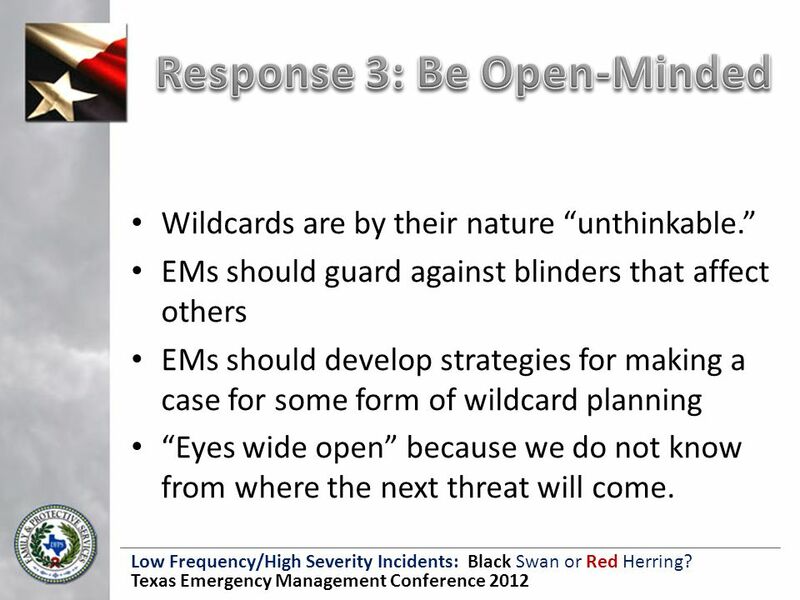 Texas Emergency Management Conference 2012 Wildcards are by their nature “unthinkable.” EMs should guard against blinders that affect others EMs should develop strategies for making a case for some form of wildcard planning “Eyes wide open” because we do not know from where the next threat will come. 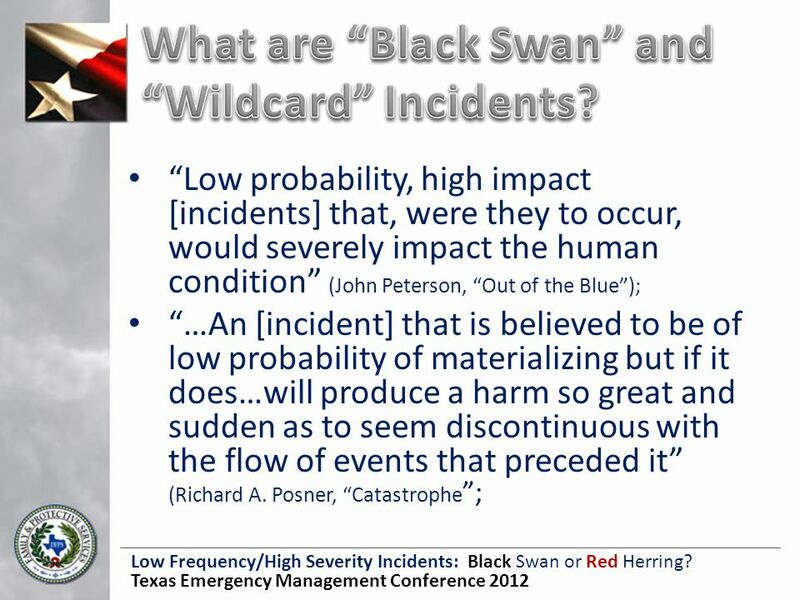 Download ppt "Low Frequency/High Severity Incidents: Black Swan or Red Herring? 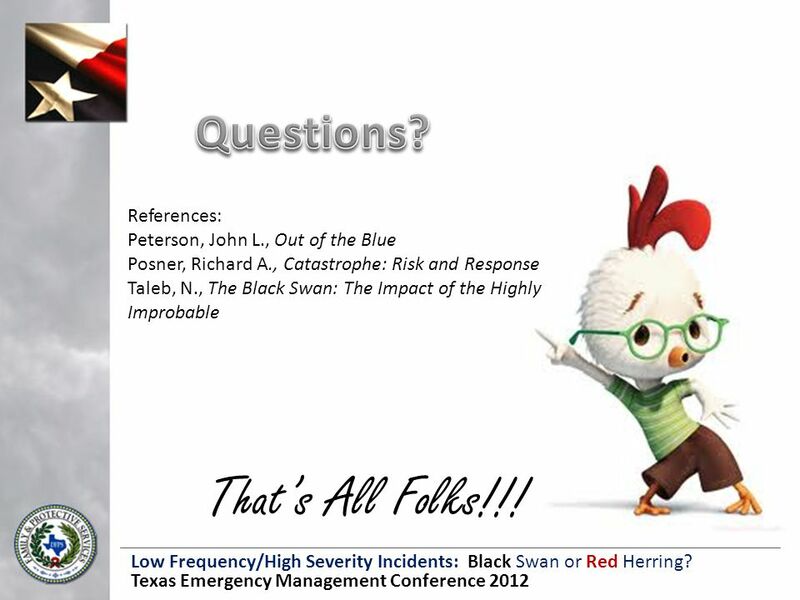 Texas Emergency Management Conference 2012 Black Swan or Red Herring?" 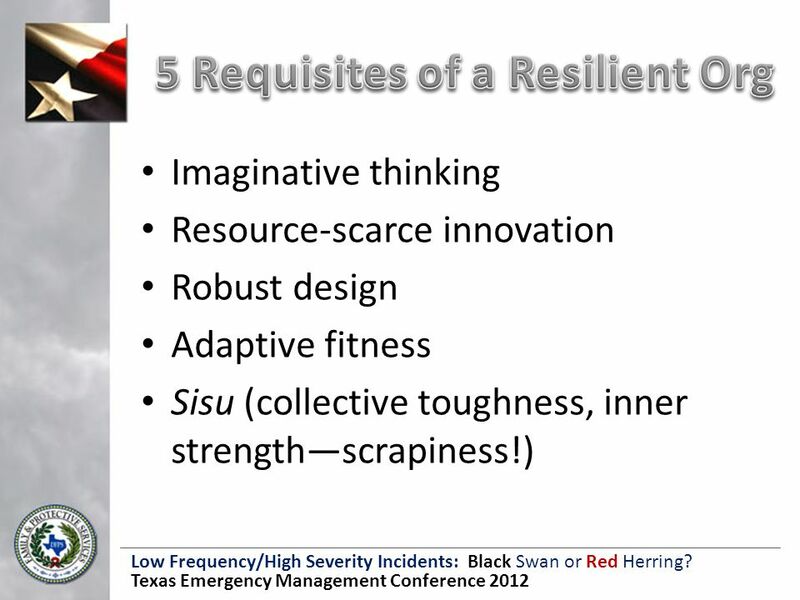 Being a Resilient Teen Everyone goes through times of stress, disappointments, and difficulty. When hardships and tragedies happen, it can be hard for. 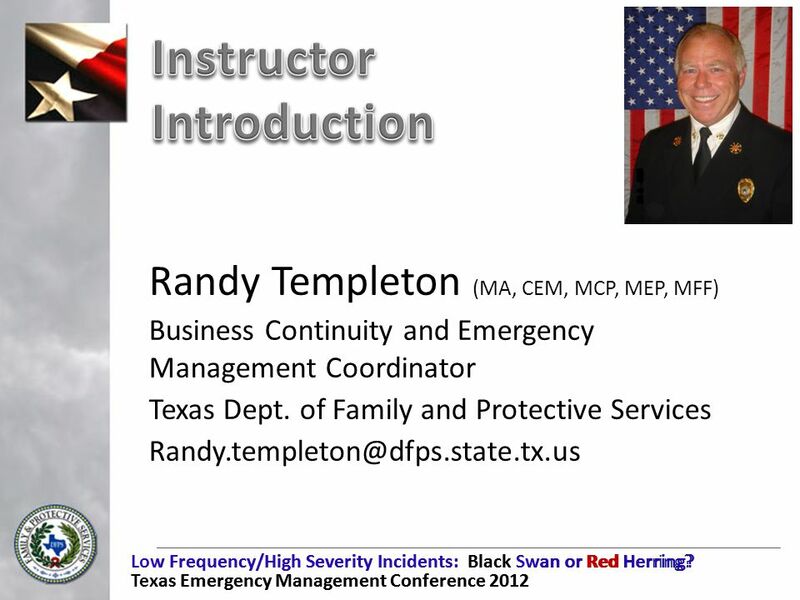 DISASTER PLANNING: Do it Before Disaster Strikes Community Issues Satellite Workshops Department of Commerce & Economic Opportunity. 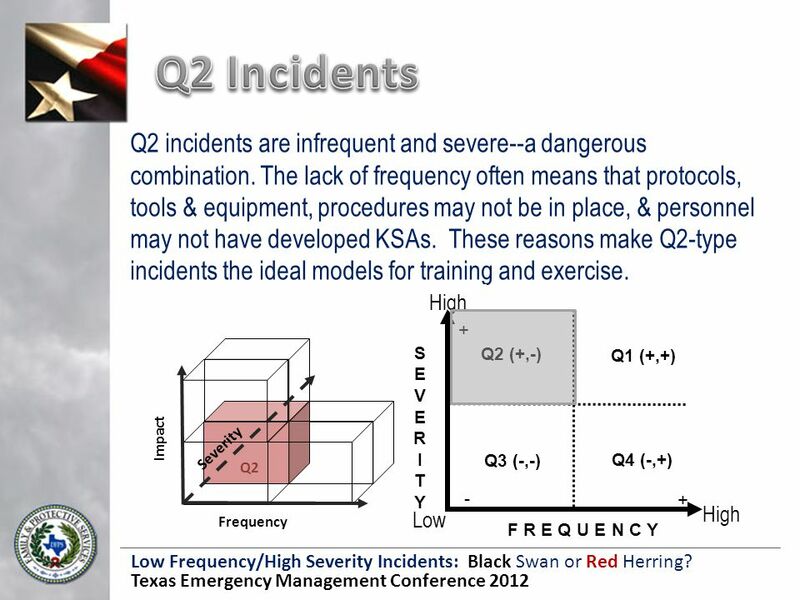 1 Henry P. Cole University of Kentucky Southeast Center for Agricultural Health and Injury Prevention Paper presented at the “An Agricultural Safety and. 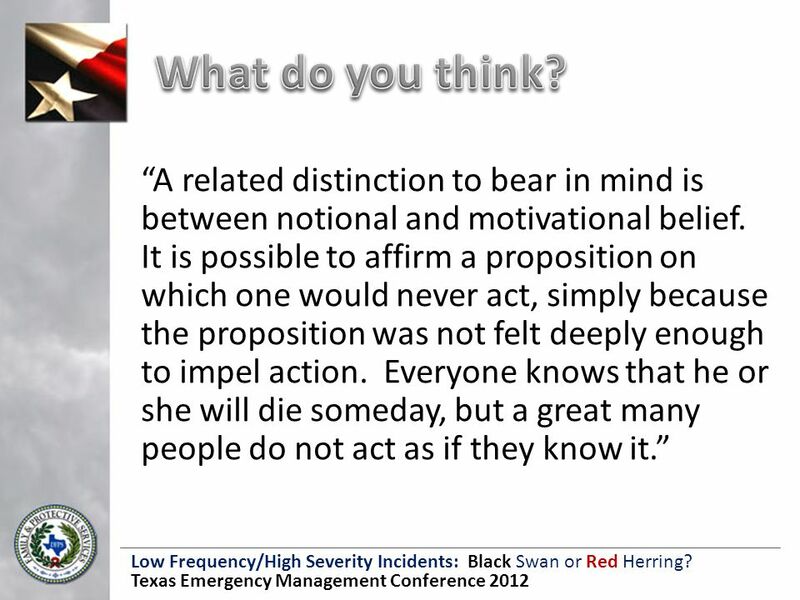 Values, Ethics and Business Decisions From Ethics to Ethical Rationality Marc Le Menestrel. 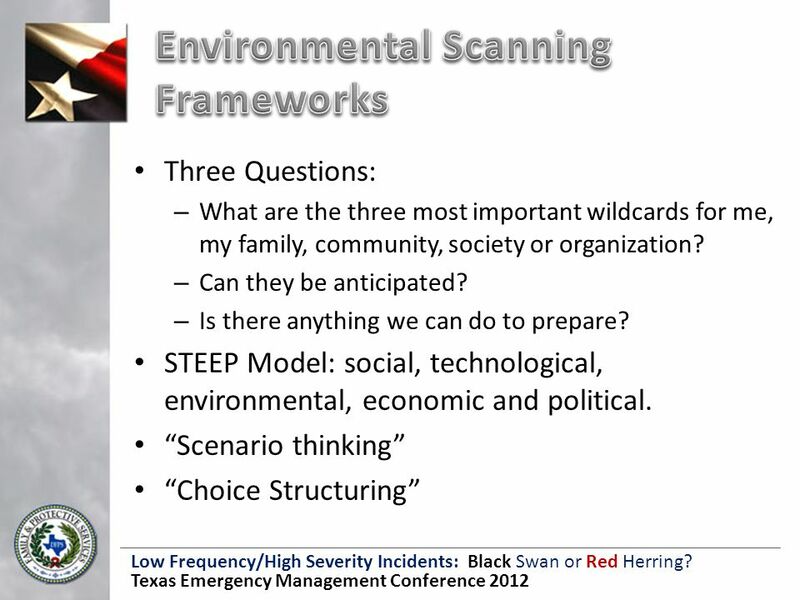 Role for Science in the Global Management of Extreme Geohazards Deborah Brosnan. 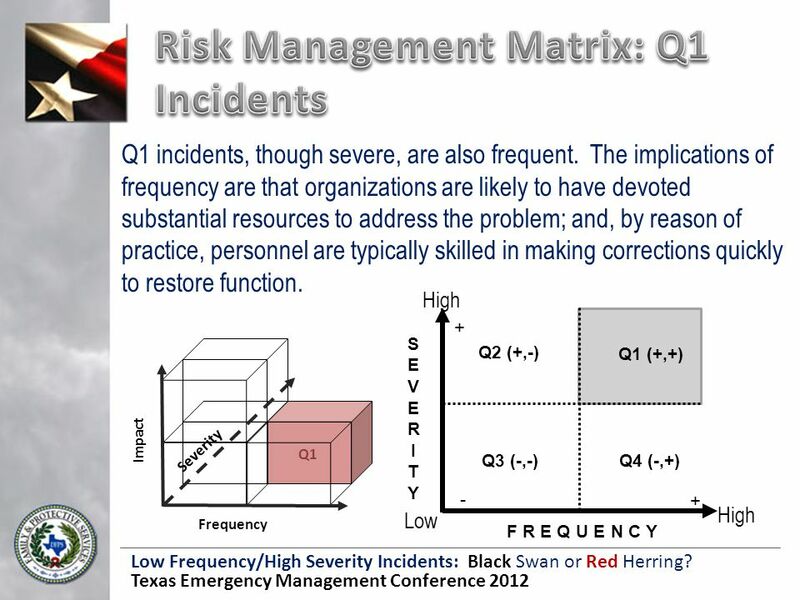 Crisis & Risk Management Introduction. 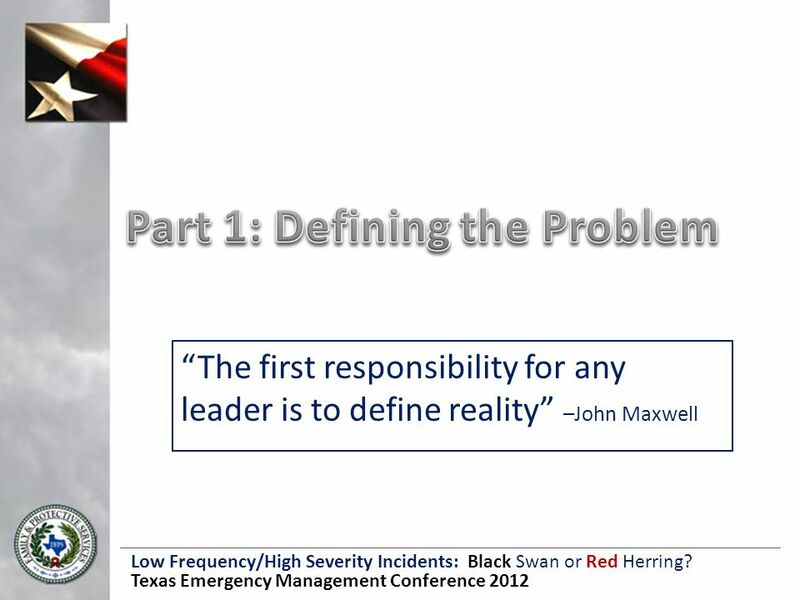 Crisis happens more than we imagine. They are not always easy to see unless they affect our own lives. 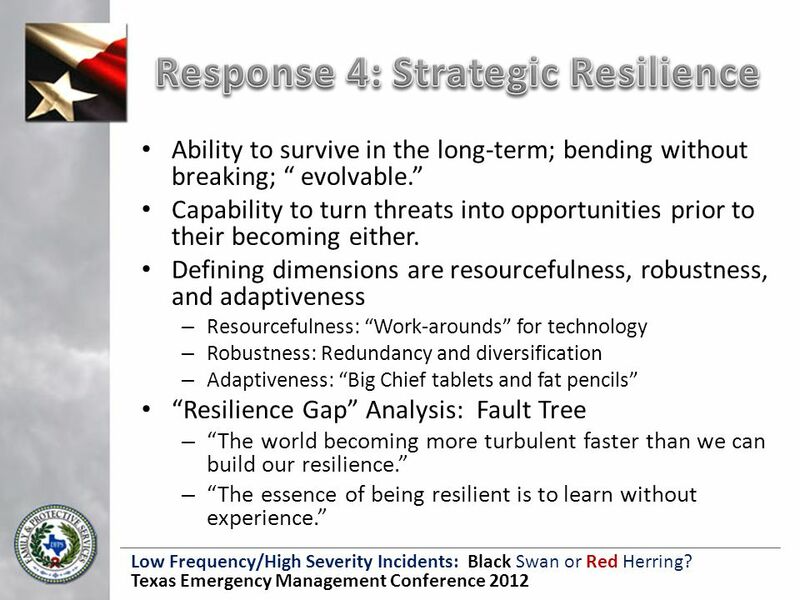 Vulnerability and Catastrophe Understanding and Addressing Liabilities and Capacities. Summer Camp: Duty of Care as a 4-H Staff Member Connie Coutellier, consultant, author, trainer and member of the 4-H State Camp Advisory Committee. 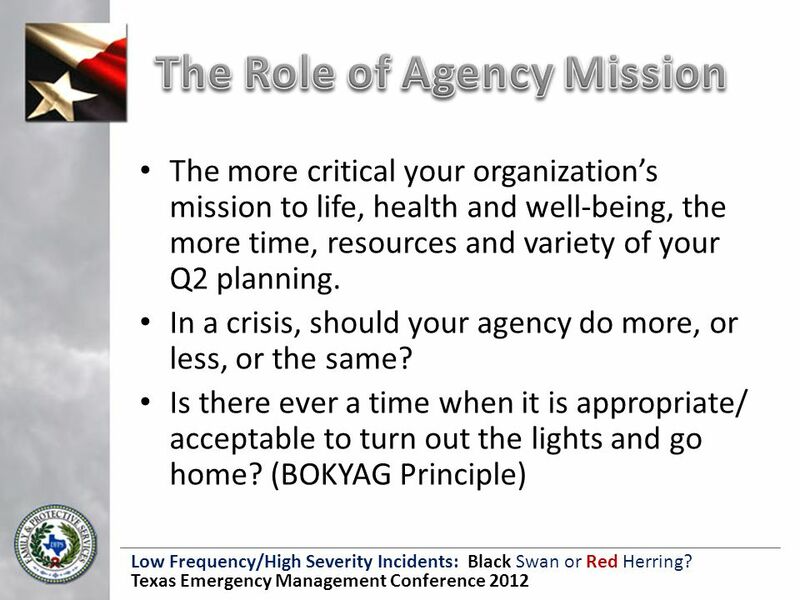 Crisis Management Planning Employee Health Safety and Security Expertise Panel · Presenter Name · 2008. “Whether you think you can or think you can’t, you are right.” Henry Ford. What is Philosophy? 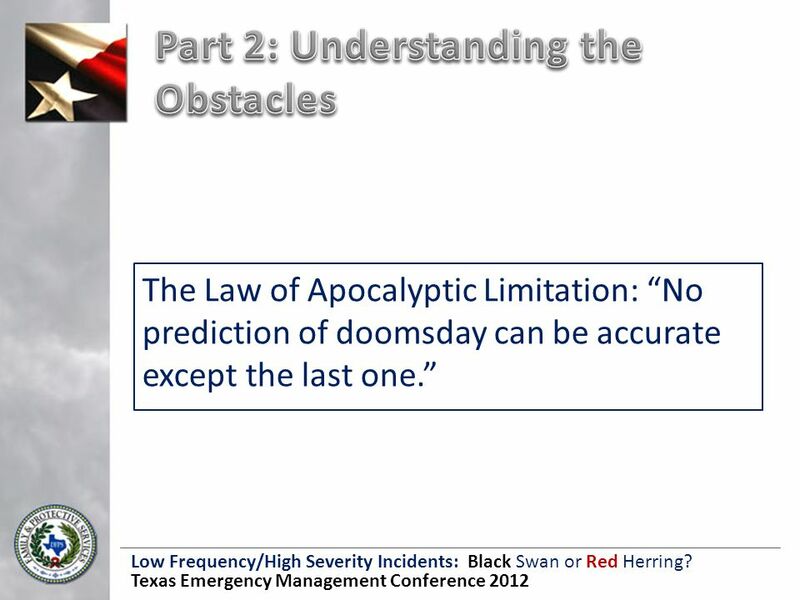 The investigation of causes and laws underlying reality Inquiry into the nature of things based on logical reasoning rather than empirical. 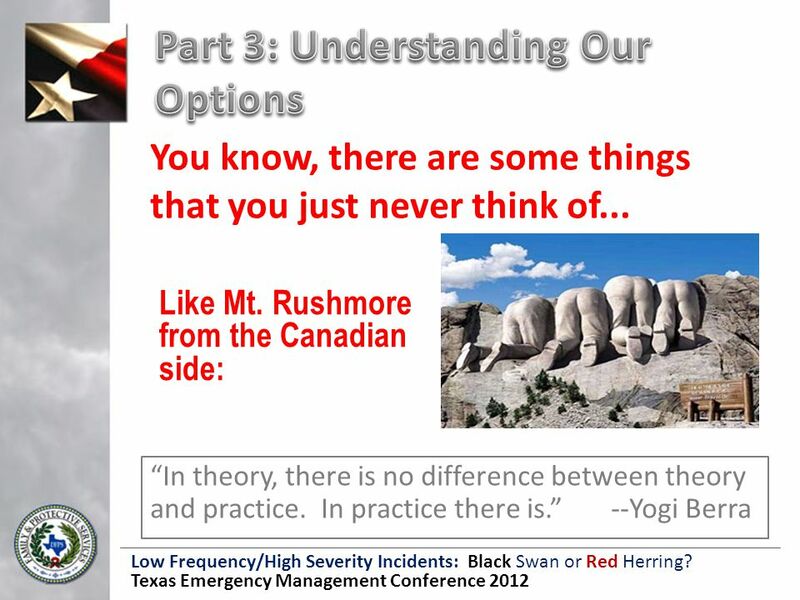 Chapter 2 Organizational Environments and Cultures. Life After COR Holly Elke CSP, CRSP, CHRP, CMQOE Life After COR.